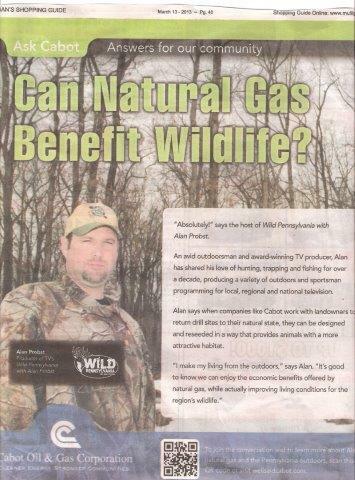 In a recent gas industry ad, hunter and sportsman Alan Probst proclaims that natural gas drilling will benefit wildlife. On the one hand, he’s right. 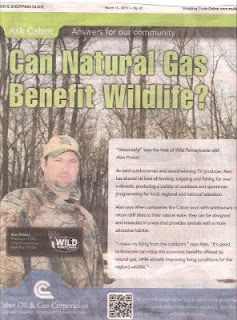 The pipeline right-of-ways that cut through forests, will need to be kept free of trees for as long as the gas shall run. And as all deer hunters know, those right-of-ways make great habitat for deer. What he doesn’t say is what everyone already knows: we already have too many deer for the hunters to keep up with, and that deer population has tremendous and far-reaching impacts on our forests. If you grow a garden, or walk in the woods, you already know this. When is the last time you saw young tree seedlings in your woods? According to Bernd Blossey, associate professor in Cornell University’s Department of Natural Resources, it takes ten years for an oak seedling to grow tall enough to survive deer browsing. Most don’t make it past two. He cites a research project in the Allegheny National Forest that demonstrated some of the impacts of deer on the landscape. Instead of excluding deer from areas, scientists enclosed deer inside of fences. That way they could control the population density of the herds. After tabulating tree regeneration for a decade the researchers found a clear relationship between deer pressure and the diversity of trees in their enclosures: a more diverse population of tree seedlings grew where there were fewer deer; more deer led to a less diverse forest. Bad enough news for those depending on the back-forty woodlot to regenerate itself in a sustainable manner for the next generation… But the impacts go beyond timber interests. The researchers also looked at caterpillar populations in the various enclosures. Where the deer density was low, there was a high population of caterpillars; more deer meant fewer caterpillars. And that has huge implications for the forest-dwelling birds that depend on caterpillars to feed their nestlings. Some studies find an abundance of birds in the forest canopies, but few in the mid-story and shrubs. And aren’t birds wildlife too, Alan? The assertion that deer are overpopulated is only used by hunters as a justification for hunting. It is a statement which is not based on science. If there was any objective definition of overpopulation as defined by causing damage to forests, I can assure you that deer would not be the species at the top of the list. Bill - the deer population is higher than the forest can carry. That's shown by the science. That overpopulation is due to lack of predators and all the "free food" we provide deer. So in large part, we contribute to that & ought to manage it better. Reuse Fracking Wastewater to Irrigate Crops?